The tiny town of Colon, Michigan is home to a little over 1,200 residents, but in many ways it's actually larger than life. The town's major claim to fame is that it's the "Magic Capitol of the World." The story of Colon's magical beginnings goes back to 1925, when renowned magician and illusionist Harry Blackstone arrived in town with his troupe. He would spend the summer months there performing for the local residents, before hitting the road. Shortly thereafter, Blackstone's friend, a fellow magician from Australia, Percy Abbott, came to visit and established a magical supply shop. Together they helped put Colon on the map. Colon is also home to the world's only "Magic Walk of Fame". Here you'll find bronze stars embedded in the sidewalk pavement that forever immortalizes the premiere magicians from back in the day. Harry Blackstone Senior's star is in front of the Colon Masonic Lodge, and his son's is in front of Curly's Restaurant; Percy Abbott's is by the First Merit Bank, and there are roughly a dozen more stars around town to discover and pay your respects. Home of Abbot’s Magic Manufacturing Company is considered "the world’s largest producer of magic paraphernalia." Any item you'd need to in order to pull a rabbit out of a hat or to assemble a vanishing cabinet, you'll likely find it here. Which is good, because every August Colon becomes the mecca for magicians from around the world to gather and attend Abbott's four-day Magic Get-Together. For four days magicians, wanna-be magicians, curiosity-seekers, and journalists looking for a good story converge to attend seminars, performances, and demonstrations by the world's best illusionists. It's absolutely an experience you'll never forget. Sterlini Magic Manufacturing is a relative newcomer to the magic scene in Colon. It opened in 2001 and is mostly an internet company, but there's a real brick and mortar store in Colon, which is open seasonally in the summer months from May through Labor Day. Sterlini has "built and supplied props to some of the top names in magic - Silvan, Ed Alonzo, Jason Byrne, Michael Finney, Jeff Hobson, Dan Sperry, Laurent Beretta and Franz Harary just to name a few." The company states that if you do plan a trip to Colon they'll "be glad to open our doors for you, day or night" by appointment." The FAB Magic Company, Inc. If that's not enough to satisfy your magical needs, the FAB Magic Company has 15,0000 square feet of magical offerings. They market themselves as the world's largest manufacturer of handmade magical items. They also host their own magic festival each year as well as a magic camp. 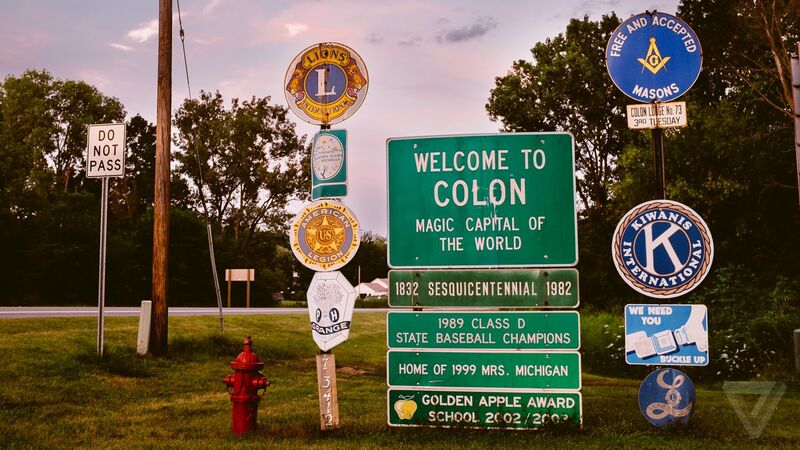 As magicians and illusionists from all over America, and even parts of the world, have discovered Colon over the years and become enchanted by the tiny town, many have decided to make it their final resting place. Lakeside Cemetery has 28 magician graves, which makes it home to the world's largest concentration of interred magicians. If you're looking for a place to stay while you're in town, the Palmer Lake Lodges are the perfect lakeside getaway. It's a family-owned bed and breakfast with cabins just a few steps from the lake, with pontoons, fishing boats, and paddle boats available for rental. They also have an onsite seasonal summer cafe, which serves light meals and local ice cream. The best time of year to visit Colon, Michigan is summer, and specifically, those magical four days in August when the magic convention takes place. But, honestly, the summer months are beautiful in the area in general. The residents are lovely and very friendly. The area is steeped in history and lore. You're sure to have a magical time.